Deputy Premier Dr Kedrick Pickering said the BVI’s Decision March was effectively a declaration of war on the United Kingdom (UK). 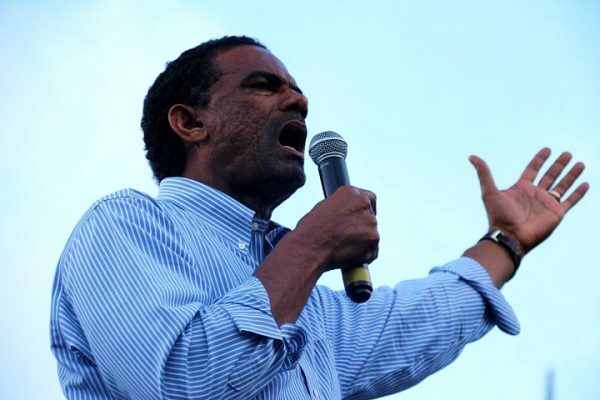 At the time, he was addressing the colossal crowd of protestors that marched to the Governor’s residence in Road Town on the island of Tortola, yesterday May 24. 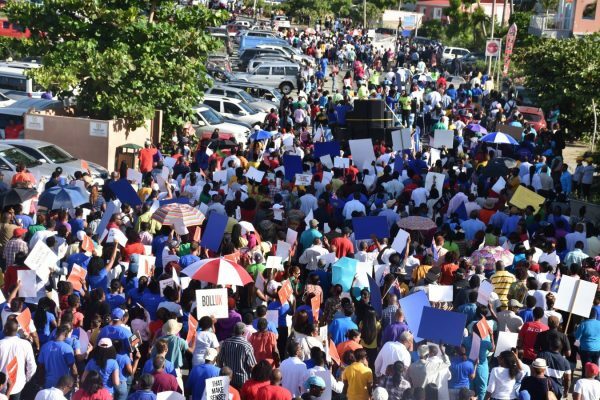 The march signals the territory’s displeasure towards UK legislators for using what is being described as “constitutional overreach” to pass an amendment to their Sanctions and Anti-Money Laundering Act — a law that is feared will cripple the BVI’s main revenue earner, the financial services. “We recognize that while we stand here today (yesterday) we have declared open war against the UK … there ain’t no turning back,” said a fiery Dr Pickering, who then noted that the territory’s “divorce from the UK” does not have to be a bitter one. “Let us just separate in a nice and agreeable way. Let us sit down and have a conversation,” he said. The Deputy Premier then told members of the BVI public to prepare for battle and stay tuned to the various strategies that will be unfolding in the coming months. Dr Pickering’s statements have caused persons to speculate whether the BVI — whose leaders are known to occasionally threaten going independent — is truly taking a more serious consideration at breaking from the UK. But the Deputy Premier said independence is not the only option for the BVI. “There are no independent nations in the world today. Everybody is associated with somebody,” he reasoned. In the meantime, Dr Pickering said he is recommending that the BVI solicit assistance from three scholars to assist the so-called breakaway. He said the idea would be to employ intellectuals from as far as the Asian-Pacific, Europe, and the Latin America-Caribbean region. He further said the scholars would be tasked to come up with suggestions on the nations that would be best to associate with, and what path the territory should take. Pickering said that recommended plan would include being a part of various bloc of countries in the region such as the Organisation of the Eastern Caribbean States — more commonly known as OECS; the Caribbean Community, which is commonly referred to as CARICOM; and the Economic Commission of Latin America. Additionally, the Deputy Premier said business, religious, and other community leaders will be teaming up with the political leaders as the territory moves forward. He said the projected roadmap for the BVI is to ensure the territory’s economic survival. Meanwhile, protestors yesterday signed a petition that Governor Augustus Jaspert will eventually present to the UK. The UK law being protested is forcing the BVI and other British Overseas Territories to implement what are known as public registers of company beneficial ownership. These registers mean the BVI is required to publicise the names of beneficial owners of offshore companies registered in the territory. Effectively, beneficial owners are persons who own property rights to a company even though the legal title of the property is in another person’s name. Publicising the names of these beneficial owners could discourage them from doing business with the BVI as it relates to financial services. The BVI’s financial services sector accounts for 60 percent of the territory’s annual revenue. Notably, the UK has imposed the law to tackle financial crimes such as tax evasion, which they claim is rampant in the BVI. The territory has been described as a tax haven which has been associated with financial scandals such as the Panama Papers leak back in 2016. Hadn’t really any doubts before but this confirms it that in my opinion Dr Pickering is a total D….k H….d – to twist things as he has done and make this a March for Independence and declare war on the UK is tr—- and treacherous after all that the UK has done for us…..I did warn people not to be associated with this March and fortunately it was a very poor turn out when you consider all the teachers and school kids that were told to March….interestingly very few that actually work in financial services actually attended! Funny, could this be the beginning of WW3? Perhaps the Russians will come to the rescue, or just swing by to collect their Dirty Money, maybe the Cuban is onto something! WW3 has to start somewhere… ”we shall fight them on the beaches (not brandywine though)” convene the war cabinet… or maybe just sit down and have a conversation. Ok we dump the UK…What’s next? We still need a partner to support us. Which sounds better: North Korea Virgin Islands, Libya Virgin Islands, Somalia Virgin Islands. Virgin Airways Virgin Islands works for me. We’d get a huge runway but we’d never get anywhere because everyone knows virgins don’t go all the way. BOOM! party tent at West End. Perhaps I could join the army and create barricades from the hundreds of abandoned scrap cars littering the place. I could maybe join the BVI Intelligence Corps but I wouldn’t like the solitude. Or the BVI airforce if only I could actually land on V. Gorda since your government closed the airport because you can’t find a spark plug for the firetruck. Oh, and we don’t have any planes because you can’t even find the ones we own. Or air raid warden, defending these islands from the inevitable fires that will rage after the British bombing runs. After all, we’ve shown how capable we are with fire control at Cox Heath. Then there’s the Military Police I could enlist with because we have such a great track record of securing the prison without the help of the UK. On second thoughts, I’d rather have the UK run as much of this place as possible. I surrender. We don’t even have a hurricane recovery strategy but yet we want to be independent. NDP go sit your a$$ down. BVI needs new leaders, not recycled ones who have no clear plan for this country. Join the BVI Submarine Service cause everything is sinking fast. Everything else but the one who took the food from our mouths, There is no turning back. What in God’s name does that mean? If you use English we can know what your point is. I like Wh??? ?r!ng Virgin Islands better. I’ll mean the same ting. I agree with you, Really. Planning our next step should be done wisely and with the whole population. This was a direct result of the economic bomb blasted by the UK. When you are flattened there is no choice but to rise and fight back. Instinct and survival prevails. Actually, you want the opposite to prevail. You should be intelligent and calmly respond in a way that actually achieves the objective you desire. Emotional grandstanding feels good but is useless. Unless you are a BVI politician not wanting your dark deeds to be uncovered. In which case a bit of a smokescreen is useful. It diverts attention from the basic facts and leads people to think that the reason for their poor social wellbeing lies elsewhere. Have we not continuously complied obeyed and cooperated to the extent that we have gone above and beyond what has been asked and required? The UK flagrantly violated our constitutional agreement with them,trampled on our human rights but we must continue the doormat syndrome? Seriously? Why? There is nothing to lose but only self respect to gain. If the uk violated our constitution we have nothing to worry about, do we? Obviously our government will go to court and have it struck down. I think that’s unlikely otherwise the uk wouldn’t have felt that they could do it. After all, we signed the constitution too. If we are so smart we wouldn’t have signed something that would be detrimental to our wellbeing. Since financial services started here, we have the worst record on Earth for making money that’s dirty, corrupt, violently obtained, stolen, blackmailed, smuggled, sliced, evaded, extorted, etc etc etc etc – just disappear! All we hear about is our compliance. The world sees our track record, which stinks. But all this threatening ranting does is to lower the BVIs reputation in the U.K. and the rest of the world. “But the right is more precious than peace, and we shall fight for the things which we have always carried nearest our hearts–for democracy, for the right of those who submit to authority to have a voice in their own Governments, for the rights and liberties of small nations, for a universal dominion of right by such a concert of free peoples as shall bring peace and safety to all nations and make the world itself at last free”. been successfully invaded since the Romans. What do you intend to fight them with? There is no fight they said if we want to go independent, so be it. They do not care either way. They actually said that way they will need to send less money to the OTCs. Well that escalated quickly…Be very very careful of what you are saying and doing. Dr. Pickering you are wrong to have done this. If you want a march for independence then organize a march for independence – be honest with the people, tell them what it is about and let who wants to join be there. Do not use a march against UK legislation as a platform for something else. That is not why people were there and you were wrong to imply this. Many people were there who do not agree with a ‘divorce from the UK’ – this is exactly the reason I did not go. This place ended the minute Pickering took charge. Britain could care less about a march even if they are remotely aware of it (which they are not). This march was not about the BVI, it was not about the financial services industry. It was about creating a bogeyman (the UK) so the local politicians can try to manage things here without scrutiny so they can cover up their dirty deeds. They know that as long as Britain has eyes on them they cannot get away with things. Both parties are as bad as each other. If you think things are bad now, wait till we independant! Then you will see real poverty and corruption. It seems as if we march for the wrong thing you mean they are still doing things behind our backs people be very careful we cannot go independent and if we go we will worst off than HAITI no offence to HAITI. This is the same man who like to use the word done deal. Well the tide change how you like that done deal. Sorry but you all are on here talking without knowledge. The Lord in the House of Lords said if we do not like the law, we could go independent. So if the is the only option why should we not take it. Two why would we be like Haiti. Uk does not support us since 1976. What do they give us not a red cent! So why would be worst off financially if we separate from them. Tell me how! I am listening. That Lord was one among many that spoke. He was one of only a few that spoke in favor of the amendment. The reason he said this is because the pro amendment people think it is morally wrong for us to make a living off the backs of the poor and oppressed of the world, off criminality and corruption – helping perpetrators make their gains disappear. That’s how they see us because we have been associated with so many dirty scandals. So they say, if you want to be dirty, go away! Why would we be poor? Well for one thing, the same financial services would run a mile if we go independent. Unless we keep our financial services and openly court dirty money. So that’s one pillar gone. What else do we have? Tourism, yes, but we’re losing our reputation already due to hurricane, obvious incompetence and this special BVI hatred of outsiders. Back to farming and fishing. The finance industry in BVI is more successful than ones in other places because it is “British” . Take away the “British “ bit and say goodbye to most of it. And a few tourists too. And VI would be defenseless. And the ministers and their pals would steal even more than they do now. Become independent of the United Kingdom and you would suffer more. The United Kingdom is not a colonial power. The BVI is not under any colonial rule. The United Kingdom is a powerful nation that protect human life all over the globe. The United Kingdom is not abusing the British Virgin Islanders human rights. They are more of a help than a hinderance. They are not standing in the way of British Virgin Islanders moving forward. Get real. Find a another industry beside the Financial Services industry. Look around you and you would see what is going on in the modern/global world. The United Kingdom just wants the BVI to move forward to attain global standards. The United Kingdom is a country that meets global standards. Her Majesty Queen Elizabeth The Second is not a dictator. She is the world’s most peaceful monarchy. If anything else the British Virgin Islands should bow down to Her Majesty Queen Elizabeth The Second because the United Kingdom is one of the most peaceful countries in the world. Why start a war with a peaceful country? “The United Kingdom is a powerful nation THAT PROTECT HUMAN LIFE ALL OVER THE WORLD” LOLOLOLOLOLOLOLOLOLOLOLLOLOLOLOLOLOLOL! *choking*LOLOLOLOLOLOLOLOLOLOL!!! YOu do know the Q—– family and the ——- kidnap children from poor third world countries and use them as prey in their HUNTING PARTIES right? Nope you sound like you at least in 70’s so you nearly senile. That was I– Amin, not The Q—. He tried to fight Britain and look what happened to him. How quickly you forget what the UK signpost Irma. You the stupid one. @Maria Louisa Varlack what is wrong with you did you just say BOW DOWN, if you want to remain under the foot of some one go right ahead…you know what come and serve me please. Don’t know if ill take any pleasure in it but hey I am willing to find out..
She is the personification of a m– m–. I could not have said this any better myself. Well firstly this has little to do with human rights and more to do with economic and constitutional rights. Secondly why should we have to find another industry after we built this one and made it a success? We? The British built it. Please tell me you are NOT serious “she is the world’s most peaceful monarchy”. That is an awful picture their intentions are not what they make it out to be. We are in so much trouble. LOL! These traglodytes teach this man everything he know and now you declaring war on your master? HEDIOT! just one question: without the uk army, how the bvi government will have handling the looting after Irma and get back all the escape prisonners?. The BVI Governments of both parties been looting for years. When the UK run this place P…. will be the one in Balo. only a weak child would declare war on their own mother. Try learning English before you declare war on them. Will you like the brave politician KP be leading the charge against the British Paratroopers or sitting on your a$s at home urging others to do it. ? Never took to this guy but ill leave a little space for misunderstanding, How do you declare war and ask for a peaceful sit down at the same time. Constitutionally the BVI doesn’t have the power to declare war. We need to go back to basic principles. If the BVI wants to declare war it is going to need to become independent first. Then it can declare war, although I think that would be foolish. Pickering does feel good that he killed a————-, l—- ——– and f——— so he now is trying to kill the —? Pretty hard to declare war on the country that pays for your defenses hahahahaha good old BVI shooting themselves in the foot. The people making the decisions are literally 4100 miles away from the people demonstrating. I don’t think they saw or heard you lol. P——— just played every single person who marched into publicly supporting him even if they disagree. Wake up folks. You need to pay more attention than this if you want to have your own country…. Let it be known that the organizers and speakers of the march do not speak for the people of the Virgin Islands and this will be reflected in the results of the upcoming elections. They rounded up immigrants and school children and a tiny fraction of belongers on scare tactics to march blindly under the pretense of opposing a nonopposable bill. The prophets who etched them on guaranteeing victory are not of God and will soon feel his wrath. All the deaths they procured will never give victory. God save our beautiful BVI from those wretched evil men and women and God save the Queen. To God be the glory He protects his own. you had me till the last paragraph, why bring God into it? Certainly there are many other countries that could willing and would assume the role of defense for the BVI. That chouce would be ours to.make. If some country wanted to attack the BVI,what makes you think that the UK would defend. Based on the current events there is no reason to believe that they would. Indeed. Can I suggest that you volunteer to go to speak with Kim Jung Un. He is the leader of North Korea and will give your request the respect it deserves. If BVI break away from UK. Then they can join the USVI or become a Independent country. I think “America” the “usvi” BOSS might have a say in that. You think America wants more responsibility? They ready to let puerto rico loose at on the drop if a dime…the usvi would be dropped like nothing also and do you think the usvi or puerto rico would give up their “american citizenship” you must be mad. Its only “us” who think thats it’s a “country” and not a “territory” playing with our citizenship…we just have “autonomy” unlike puerto rico and usvi. But America makes the orders for usvi and pr as they are not “countries”. Why is it that the usvi are so proud of their “american citizenship” and we are being ignorant with our “british citizenship”? Aint all vi together..we go independant they aint joining with us….they staying “american”? Or get an experienced and respected leader like Robert Mugabe in to make us into the Caribbean Zimbabwe. BVI/UK DON’T START A WAR! Join the USVI peacefully and then the United States can have the Baths on Virgin Gorda. 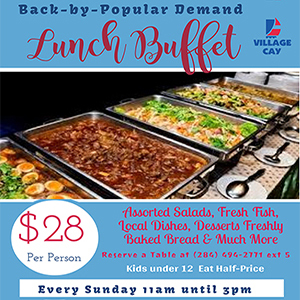 Both the BVI and USVI population is mostly black with the same currency, national dish, and culture. we would lose the right to the US$ if we go independent. You see how the US treating PR after Maria, you really want to go there? how is the US treating PR by giving them billions of dollars to fix back their broken infrastructure. How much has the UK giving to the BVI than promising to sign a promissory note. Don’t mind all the noise in PR if they was an independent country dog would have eaten their lunch. There is no comparison what the U.S. has done for it territories compared to what the UK has don. what on earth has color got to do with this. seriously this is the type of narrow mindedness, what century are we living in, you know all colors and cultures live together in other countries right. So wait a minute, thousands of people marched and Pickering makes a statement and all hell breaks loose? Pickering can say whatever he wants but BVI people will not support the independence nonsense. Fake news – it wasn’t thousands of people I doubt it even managed to reach one thousand which indicates how underwhelmed most sane people feel about the No Direction Party – they are absolutely clueless! PThis was the most hilarious and frightening event since IrMaria!! Awesome!! Some have shownheir hand and true colors. P and p whom marched and vocalized their opinions yesterday only do so for MONEY!!! Lol…all those other familiar non-FS workers were hoodwinked by the NDP marketing arm. This was just a warmup/test-run to gauge the electorate’s temperature for the NDP. As Cubano said; more to come in months (Its politics time again folks how you gonna vote now?) – watch as the political rhetoric amplifies and to the tune of “Colonialism is threatening our livelihood”. Such a farce and it should be clear to ALL whom these Great Pretenders are now. P and P, cut from the same cloth and all about their own interests; not ours. As many have asked, and so shall I. Where were you all when the murders took place? Why wasn’t there a march for the injustices? I guess P & P are the same – especially for this lot here!! The man is a complete d**khead. So when do we march against him and the rest of those clowns? A divorce indeed! I can’t see where anything he has done has actually helped to improve the BVI. Seems to me he has done more for outside interest than he has for the people of the BVI. The VIP, NDP all need flame-throwers taken to them. The time has come for politicians who are real civil servants working on behalf of the people and the territory. The time for politicians and clergy spouting emotional, divisive rhetoric is at an end. Enough already. No matter how he twist it, he is talking independence. Since when are we declaring war on the UK? No need for this kind of rhetoric. ‘We have the brain power to do it”……hahahahahahaha. No you don’t!!!! Have you never been at war or even declared war with a friend,foe,family member ,a business. Well I have, Presently I have declared war on Digicel. A figure of speech is clearly discerned unless of course, you have declared war or is at war with, as in this instance, a political party and or one of its members. Then silliness coupled with ugliness results in ridiculous pronouncements and judgements. Imperialism on the other hand, is one of the main causes of armed conflict and global human suffering. Nothing to be taken lightly,ever. lets do the maths! the insurance company gave the government admin complex 11.4 million and gave the BVIEC 10 million for the restoration and loss of lines, poles, transformers, vehicles and damage to the generation building Can someone explain this to me? This guy needs arresting, all he is doing is trying to manipulate the people to do what is in his interest. Is he working with C——? The petition could have easily been a referendum that the people were signing and those signing would not have known that they were signing for independence, making a bad decision for all of us. That is how dangerously deceitful this gov is, all of them and their advisors. Those desperate crazed low down moves, makes the blood run cold, how easy people here could be hood winked. UK is not the enemy as they are making the UK out to be. Why hasn’t Cayman, Anguilla and the others marched? Why aren’t they talking independence? Think people. Think. After signing this petition and presenting it to the crown, what does the mean for all of us, even though we did not sign the petition nor support the march?. Did they just sign away the UK privileges, cut all ties with the UK and forgo a referendum? How can you trust a gov that said that they were marching for one thing but had the people sign for independence from the UK? If you found out that BVI was independent tomorrow by those actions,what would you do? What preparations have you made? Half of you could not go anywhere after the hurricanes because you had no where to go even though your situations were not ideal and had to watch others get airlifted to a better life. Everyone says a referendum was needed but how do you know what the gov discussed and agreed with the crown when they could not be truthful with what they had the people sign? The concern goes bigger. HOW MANY NON SIGNERS SIGNED THE PETITION. If a copy of the petition is ever ever ever made available to the public-the supposed signers, will you see your name or your children or long gone countrymen name there? Is it possible and quite probable that the Constitutional agreement of BVI with the UK is not the same as Cayman et al. There are reasons indeed for the different approach. Actually I think he was so desperate for some notice to be taken by any of the press in the UK that he deliberately came out with this stupid statement! After all the March was a massive disappointment numbers wise for the NDP – which shows what the majority think as less than 5% attended and that included all the teachers and school kids that were made to March! And still the UK didn’t even raise an eyebrow – as somebody said it had as much influence as a gnats fart! Better to keep mouth closed and be though a fool, than to open it and remove all shadow of doubt. Our diginity is being eroded by a few for power. Be careful what you ask for. After pledging to the queen one is declaring war. Educate the people on the truth of the matter. It comes like we are becoming a barbaric society. Where are the morals we enjoyed having before? Words can cause harm that we prefer not to experience. 4. They blame others for their financial woes – Venezuela blames the US and the BVI blames the UK! Dont forget it is allege that non locals are too dealing drugs and having while parties. The leader and his team have all of us in this mess. The leader never come clean with us all we can do is pray for our little ISLANDS and do not put back in the crooked ones who bring down this place and who plan to run in the next election these people is planning to come like a thief again and call a snap election. I am asking the preacher if you truly a man of god do not add gas to the fire. The VI has been independent since 1975. Time to wake up folks. You missed it. Of course some of the ministers would want the bvi to go independent they have enough finance to survived on with all the unknkwn money that was taken over the years. While the rest of us who is struggling to make mends meet cant even offord enough money to pay all those darn expenses especially house rent. Be careful what you wish for: you may just find that your dream is a nightmare from which there is no awakening. How you gonna declare war and you don’t have an army? How you gonna declare war with no allies again the nation which holds the only army that has protected you. Before you leaders humble yourselves before the Hand of God and assemble the people to turn back to God as a nation you assemble and march for symptomatic experiences of a nation mired in sin. Is there not a Prophet of the Lord in this nation? Is there not a man of God in this nation in whom the Spirit of the Lord dwells? Where is our Moses and Joshua and David and Joash and Hezekiah and Jehoshphat? Do we only have Zedekiahs? Word to the wise – I lament also there is nobody on the NDP that stands tall – they sadly all seem to be fighting over the trough of benefits for “what’s in it for me” – even the newer members like M have been a bitter disappointment when they promised so much…. Hey, Doctor Pickering, why not give up your British Passport in protest? Sounds like he has lost his —- … Maybe all that altitude fly around he does. How can he decide he want a divorce, would that not be up to the PEOPLE? Or are the PEOPLE going to let the inept leaders decide for them! He simply makes himself sound like a minister in some tin pot banana republic. No minister in any serious government in the world says such things. Unfit for office.